African Journal of Biomedical Research (ISSN 1119-5096) is published in January, May and September for the lbadan Biomedical Communications Group. 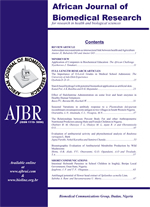 The journal is published on a page sponsorship basis (Three issues per volume). Scope of the Journal: Papers will be considered for publication from all fields. Articles from the Physical Sciences and humanities related to the Medical Sciences will be considered. Subscription information: Orders and inquiries concerning advertising space and rates should be addressed to: The Managing Editor, AJBR, Department of Physiology, College of Medicine, UI Ibadan. Tel: 234- 802-3255893. Subscription prices (three issues): N1, 050: 00 (Nigeria), $250: 00 (Rest of Africa), $40: 00 (Rest of the world). Prices are correct only at time of publication. Draw Cheques in favour of "Dr S.B. Olaleye (AJBR)"
Whilst every is effort made to ensure that no inaccurate or misleading data, opinion or statements appears in the journal, the editorial board wish to make it clear that the data and opinions appearing in the articles and advertisements herein are the responsibility of the contributor or advertiser concerned. Information to contributors: Manuscripts (3 copies and a diskette containing the electronic version of the article) should be sent to Prof. R. A. Elegbe, Department of Physiology, College of Medicine, University of Ibadan. lbadan, Nigeria. Correspondences may also be made through the journal's e-mail address as follows: ajbrui@hotmail.com or ajbrui@yahoo.co.uk Authors should consult the instructions on the last page.